The GGT Line – This is the standard Gorilla grow tent line with all of the bells and whistles. The Lite Line – These tents are more affordable and lightweight that sacrifice some fabric density for cost and weight. The Shorty Line – These tents are the same as the GGT line, but start at 2′ shorter. Aside from the differences above, the tents are practically the same when it comes to their features and build quality. The 2′ x 4′ x 6′ 11″ GGT tent I used to conduct this review. Note: I personally own a GGT 2′ x 4′ x 6′ 11″ tent and absolutely love it. That is the only tent from Gorilla that I have personally used. Considering that it looks like the build quality, durability, and features carry through to other tents from Gorilla, I wholeheartedly recommend them. With that being said, let’s get to the review! 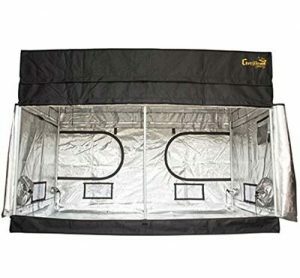 This is a long one, so if you just want a comparison of the different tents that Gorilla offers, click “Gorilla Grow Tent (GGT) Line” in the Table of Contents and go from there. Otherwise, read on. Before getting into the nitty gritty of each line of tents that Gorilla offers, let’s take a look at their general approach to grow tents. Almost all of their grow tents are designed and built the same way, so if you like (or dislike) a certain feature, chances are it’ll be the same throughout their product line. Aside from the dimensions of your grow tent, the different features are what will make all of the difference in your buying decision. Outlined in this section are the features that make Gorilla grow tents unique as compared to other tents on the market. A shot of unboxing my 2′ x 4′ GGT. A 2′ height extension kit from Gorilla. Overall, Gorilla grow tents are taller than most others on the market. With the exception of the Shorty line (covered below), Gorilla’s tents are all over 6′ tall, typically 6′ 7″ or 6′ 11″. 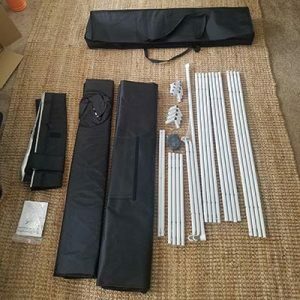 If that’s not enough for you, one of the most unique features of Gorilla tents are their height extension kits. They have both 1′ and 2′ height extension kits, meaning that their tallest tents can reach up to 8′ 11″ tall (which is more than enough for even the most ambitious indoor growers). The 1′ extension kit comes with the GGT line, making it an even better deal. Lite Line Height The standard GGT line starts at 6′ 11″ in height, and the Lite Line starts a bit shorter at 6′ 7″. However, it’s still possible to add the 1′ height extension kit to all tents in the Lite Line as well, although it is sold separately instead of included with the tent like the GGT line. As the name suggests, Gorilla’s Shorty line is built for people that don’t need to take advantage of vertical growing space. If you don’t have a lot of vertical space to place a tent, the Shorty line tops out at 4′ 11″ (though it can be extended via Gorilla’s height extension kits). Most other tents on the market top out at 6′ tall. If you don’t need more than that, then you may not find the height of Gorilla tents to be a huge bonus. I personally enjoy the extra height as I’m 6′ 3″ tall, so being able to stand up fully in my tent is a HUGE plus. Both the standard line and the Shorty line from Gorilla feature 1680D fabric that is both threaded and highly reflective. For reference, the D stands for “denier”, which is the industry-standard unit of measurement for the density of a particular fabric. Gorilla claims that their 1680D grow tent fabric ranges from 3-9 times more dense than other grow tents on the market. As the name suggests, the Lite Line has a much lower fabric density at 210D. That’s quite a bit lower than the 1680D that the rest of the Gorilla tents boast. 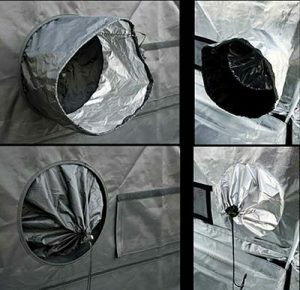 However, Gorilla claims that their PVE binding technique combines the exterior canvas fabric with the reflective interior in a more effective way than other tents on the market. This creates a more rigid fabric overall, meaning that even higher density fabrics from competing grow tent manufacturers are outclassed. Most other grow tent manufacturers top out at around 600D, with a low end of 190-200D. You might be saying, “Well, 600D is more dense than the Lite Line’s 200D, isn’t it?” You’d be right, except for the fact that other tent manufacturers typically do not use the binding method that Gorilla uses. This makes them more prone to ripping, leaking light, or simply not creating an airtight growing environment. Anytime you have an indoor garden and are growing hydroponically, there are safety concerns. For me, most of my concerns come from spills leading to staining, messes, or equipment failure. Gorilla tents come with a flood pool that installs at the bottom of the tent, with velcro strips that wrap around the poles. The pool rises about 4″, so even the largest spills should be contained within the pool. Other safety features include a roof section that blocks infared and cools down the top of your tent, meaning less temperature fluctuation from the external world. 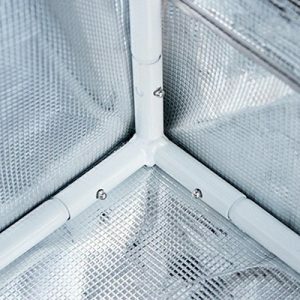 Most (but not all) other grow tents do not have pre-filters. If they do, the pre-filters are typically netted and large, meaning pests can easily get through them. The sewing on their ducting vents is less precise, meaning they can leak air. Leaking air means that mold and other annoying diseases can get in. The height of Gorilla’s standard line of tents isn’t just to allow plants more room for growth. In fact, the extra height will typically bring internal air temperature down by around 10°F. On top of that, if you’re growing in an area that fluctuates in temperature, the 1680D thickness of the fabric will actually help insulate against those fluctuations. Although the Lite Line is a bit shorter, it can still be extended by 1′ to provide extra vertical room for hot air to be vented out of the tent. 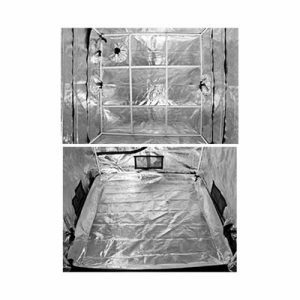 Most other grow tents come in at 6′ or shorter, which means that hot air is more likely to remain in the growing canopy. The denier of their fabrics usually clock in at about 600D, meaning that these tents are more susceptible to external temperature fluctuation. The overall build quality of Gorilla tents is second to none. First, let’s talk about the frame. Every tent has strong metal poles that interlock with each other, making sure that the entire structure is extremely stable. The corner joints interlock at every single point, meaning they are rock-solid as far as stability goes. Gorilla has double-stitched sections that receive a lot of wear and tear. Ducting and electrical ports are designed in a way that shows these tents were made by indoor gardeners and not some Chinese knockoff company. The biggest problem with other lower-end grow tents on the market is their overall build quality. If you’ve used one of these tents (like I have), you might notice that dethreading zippers and ripping corners are common issues. The frames are sometimes made of either plastic or a weaker metal and do not contain locking mechanisms to keep them in place. This makes the entire structure more flimsy, which is the last thing you want when you’re hanging heavy lighting above your plants. On top of those major issues, minor details like the design of doors, window ports, and flood pool design can all add up to a pretty frustrating growing experience in other tents. 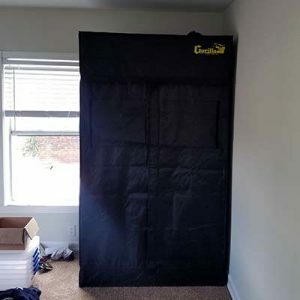 I don’t know about you, but when I tried to assemble one of the first grow tents I ever purchased, it was extremely difficult to get the canvas around the frame. This is because lower-end tents try to save on costs by making the fit SO tight that you can often rip the tent just trying to assemble it! The height of these tents also makes them hard to use, especially for me since I’m quite tall at 6′ 3″. On top of that, there are often no tool pouches or velcro straps to help hold doors, window ports, or ducts open or closed. Overall, Gorilla tents are hands down the best on the market. Of course, you DO pay for that, as these tents aren’t cheap. But if you’re willing to make the investment and take proper care of them, there’s really no other choice. As just another example, the ducting ports on Gorilla tents are 10″ large and fully cinch, meaning you can install any type of grow room ventilation that you want. 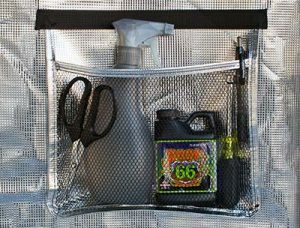 All of the little details, like the tool pouch, extra stitching in frequently used areas, and more are just more proof of the level of detail that Gorilla went to in designing their family of grow tents. The 2’x4’x6’11” GGT tent – one of the most popular in the line. The standard line from Gorilla boasts both the most features, and the most versatility when it comes to shapes, sizes, ports, and doors. 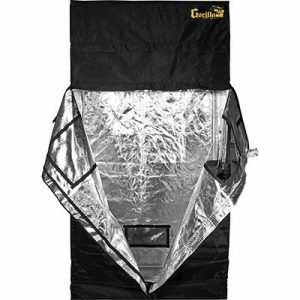 For most growers who are looking to invest in a high-quality grow tent, the standard Gorilla Grow Tent (GGT) line will do the trick. * All tents come with 1′ height extension kit. A 4′ x 4′ x 6′ 7″ Lite Line tent. Most growers opt for the Lite Line if they want to save money and have a lighter-weight tent. The Lite Line tents are about 70% as expensive and 60% as heavy as their standard GGT line counterparts. However, you do lose fabric thickness and some durability for these benefits. 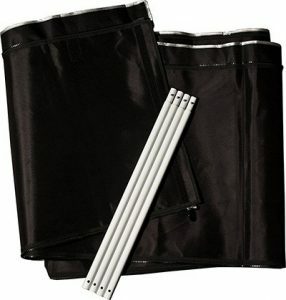 Lite Line tents are also height-expandable with the 1″ height extension kits, though they do not come with Lite Line tents — they are sold separately. In the end, it’s up to you to decide if the money savings are worth the sacrifices in thickness and durability. * 1′ extension kit sold separately. A 4′ x 8′ x 4′ 11″ Shorty tent. Aside from the height difference, these Shorty tents have the exact same features as the standard GGT line. The Shorty line clocks in at 4′ 11″ tall, which seems quite short — and it is. But if you’re growing in a small, confined space, these tents may be the only ones that utilize that space effectively. Many indoor growers are also using Shorty tents for propagation, cuttings, or early vegetative growth before transferring their plants to a taller tent for the rest of their growth cycle. 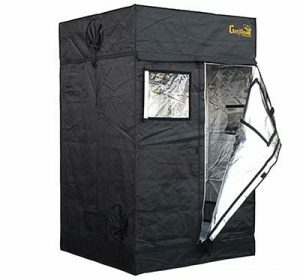 Definitely Gorilla grow tents are one of the best grow tents on the market. as the strongest grow tents have ever made.